It is best to look here before you call or email us. Why? Because we are usually working on a jobsite or warehouse and not by the computer or phone. We reply to phone and email messages at our earliest convenience. It's really faster if you check here first. If you can't find your answer, by all means, email us. You will receive a thorough reply as quickly as we can manage it. Thanks for your interest in our products! The easiest way to search FAQ is to use the Find feature in your browser (Press Ctrl +F). Type in a keyword and click Find. Each time you click Find, it will find the next instance of your keyword. To search all of Inirgee, Google is reasonably reliable. Click to go to our Inirgee Google Search. Google will not search the FAQ page, and it won't search specific part numbers, however. Good questions people have emailed, and our answers. These are InFrequently Asked Questions. What are LEDs? Are LED light strings safe? Do you have 12 volt LED sets? If one bulb goes out, do the rest stay lighted? Can LEDs run on batteries? Is there a Shopping Cart anomaly in price & shipping? Do you have battery-operated LED sets? Wow! Is the shipping really that much?!!? Foreign Orders--addresses outside the USA What do the different bulbs look like? Are you opening another store soon? Your store name is really weird. What's it mean? Do you have an easier-to-remember URL (web site)? Which Shipper is most reliable? What does "FOB" mean? How quickly will my lights pay for themselves in electric savings? Where is your Energy Savings Calculator? Are the LED bulbs interchangeable? Are the hooks on your C7 & C9 light strings large enough to fit over gutter edge? Are the hooks on your C7 & C9 light strings capable of attaching to the drip edge on my roof? Can I replace my incandescent bulbs with LEDs a few at a time, as they burn out, instead of all at one time? Is my existing light stringer OK for using the new LED Replacement bulbs, or do I need to buy a special one made for LEDs? What's so special about the RichWave LED light strings? How much power do incandescent bulbs use compared to LED? My white lights don't match. Why? What's the difference between cool white, warm white, candlelight, amber and regular clear lights? How do the RichWave LED lights work? How many lights do I need for my tree? What do "C7" "C9" "G12" "M5" and etc. mean? What are the common bulb shapes and sizes? Is UPS raising their rates? What's so different about Forever Bright LED light strings that they've earned patents? See also spam What forms of payment do you accept? Will I get spam from you? Where is your Energy Savings Calculator? Our Energy Savings calculator is right here on our Inirgee website. It is an Excel 5 file. If you have Microsoft Excel 5 or higher on your computer you can use it. Copyright G. Tom Tsao. Unauthorized duplication prohibited, but feel free to post the link on your website or BBS. Do you have 12 volt LEDs? Yes! Our Forever Bright(tm) 12volt light strings are wired for use on your car or boat. All you need is one cigar lighter adapter and the rest of the lights plug in end-to-end. The lighter adapter is included free with your order. Can LEDs run on batteries? Yes! You should look for the sets which are specifically labeled as being wired for Direct Current (DC). Of the battery-powered (DC) sets, most common are 12 volt sets. LEDs themselves are diodes, thus work nicely on DC. However, you must pay attention to the voltage so as not to overpower the LEDs which will blow them, similar to overpowering an incandescent bulb. Inirgee carries 12v LED sets which will plug into your car or boat cigarette lighter, and 4.5v LED sets which use 3 AA batteries. Yes! Brand-new for 2006 is our new line of battery-operated LED light strings. They work on (3) AA batteries. Regular alkaline copper top Duracell batteries will operate the lights for over 100 hours (we've actually tested this ourselves on a blue set), and we expect that other good batteries should perform similarly. Red and amber LEDs will probably run longer, green probably about the same, and white somewhat shorter. High-quality rechargeables will only last a day before needing recharging. We tested the same set of blue LED lights using Energizer 2500 mAh and, while the batteries keep my digital camera going for a week, will only run the LED light string for 20 hours. FYI, we tested some other alkaline batteries, and they did not last nearly as long as the Duracell. Is there a Shopping Cart Anomaly in Price & Shipping? Due to what I consider a design flaw in Microsoft's bCentral shopping cart, item and shipping costs are sometimes figured in a confusing way. This occurs when a quantity option is chosen from the drop-down list. The actual calculations are correct, but are confusing to understand. Microsoft does not have a way to correct this, so we are soon changing to another shopping cart software brand. Click here to read an illustrated explanation. Due to some quirks or errors in programming, our shopping cart (underpowered and virtually unsupported by Microsoft bcentral) sometimes calculates really outrageous shipping charges. If the shipping charges on your order seem crazy, just put a note in with your order questioning the charges, or send us an email to that effect. Be sure to include the last five digits of your order. While we handle hundreds of orders, we do handle each one manually, and every email is read and acted upon by a real live person. If there's an error, we are more than happy to correct it. In fact, if we see an error, we'll correct it without you even asking us to. It's just the right way to do business. What's the difference between Standard and Priority shipping? Standard shipping is our choice of ground shipping. This may be USPS, UPS, FedEx, or other ground shipper. Priority is our choice of expedited shipping, generally with 3 day arrival from the time the order is shipped. Priority can be USPS Priority Mail, UPS 3-day, FedEx Express or other expedited shipper. If you absolutely require a specific shipper, let us know when you place your order. Due to quirks or errors in programming, shipping costs are not always calculated by the shopping cart correctly. This sometimes results in Standard and Priority shipping being posted at the Standard rate (usually $11.94). If your order is for Priority shipping and it comes up at the lower, incorrect, rate, we will take the loss and expedite your shipping. See also, "Wow! Is the shipping really that much?!!?" Standard and Priority shipping are the same price on my order. Is this right? Sometimes yes. But sometimes it's due to a quirk or error in programming of our Shopping Cart. See "Wow! Is the shipping really that much?!!?" for details. We manually handle each order and make corrections when we see them. Which Shipper is most reliable? USPS Priority (stated 2-3 day non-guaranteed delivery) is the least reliable. We've had Priority packages arrive in 12 days before. We have also found that their delivery confirmation is unreliable. We once had a package which was Confirmed delivery but the customer was adamant that it was not received. Even though a lost parcel is not our responsibility (it is the buyer's responsibility to purchase insurance if desired), we gave her benefit of the doubt and sent her a replacement product. Meanwhile, the parcel, which had been confirmed as delivered, was returned to us by the USPS as "undeliverable as addressed," though the Delivery Confirmation still says it was delivered. The post office has refused to refund our money because (you guessed it) it's been confirmed delivered. FedEx has been very reliable. As of this writing, however, we have not used them as much as the USPS or UPS. FedEx does guarantee delivery of its expedited services. UPS has been very reliable from October-December 2006. Of all the packages shipped from all our warehouses during this time period only one package got lost. FOB means Free On Board. Basically, this means that the shipper releases ownership of an item where he states it is FOB. For instance, you will always see "FOB" followed by a city or port name. For instance, "FOB Hendersonville, TN" means the item is released of ownership in Hendersonville. Let's say you live in Sun City, KS (look it up just for fun) and we ship your order FOB Hendersonville. That means you own the product from the moment it leaves our warehouse. In other words, insuring the item is your responsibility, as we no longer own the product. Sometimes, you will see "FOB Origination" which is an easy way to say the same thing when there's other cities from where we might ship. We have locations in a few different states, and we choose what's the best location to use for each particular order. Almost all shippers ship FOB Origination. It is extremely rare for a domestic shipment to be FOB Destination. For your protection, you should buy insurance. Especially on large or expensive orders. We are not responsible for lost or damaged shipments. Are LED light strings safe? Our LED light strings are safe. We would never sell anything we did not feel comfortable using in our own homes. This line of thinking also goes with our standard of quality. You will not find "cheaply made junk" in our stores. Our lights are approved by Underwriters Laboratories (UL) and/or the Canadian Standards Association (CSA). The CSA seems to have a more stringent standard than does the UL, so some product is CSA listed and not UL listed because the manufacturer felt it was a redundant expense. Always follow the safety instructions inside each package, and of course, apply common sense. Furthermore, we consider Forever Bright LED lights to be safer than incandescent strings because there are no glass bulbs to break. Most sets are also rated for indoor and outdoor use. What's so different about Forever Bright LED light strings that they've earned patents? Consider that LED lights as a general rule use about 80% less energy than incandescents. Now consider that Forever Bright(tm) LED light strings use special circuitry that uses approximately 50% less electricity than other LED light sets! By taking advantage of AC electrical oscillations (Hertz), Forever Bright (tm) light strings save energy, and have extended life. The best thing to do is to read the patents themselves. Patent 6,461,019. Patent 6,830,358. If one bulb goes out, do the rest stay lighted? Regarding Forever Bright(tm) LED light strings, yes, if one bulb should fail, the others will stay lighted. However, if one bulb gets broken off and physically disconnected from its socket, half, or all of the string may fail. The 70-light strings are wired in two series blocks of 35 lights. Each block is wired electrically parallel to each other. This is why only one-half of the string may fail if a bulb gets physically removed. Philips and other brands of LED light strings we carry may be wired differently. At Inirgee.com, we respect your privacy. We do not rent, sell, or give away your private information or email address. We hate SPAM ourselves, so we don't engage in that practice. However, marketing is a very important aspect of any company's Customer Service Program. If people don't know that we have what they need, they won't know where to buy it. Therefore, when people inquire about our products or place orders we add them to our own emailing list. We send out mailings only once or twice per month to introduce new product or notify our customers of specials. We also believe that if you're an existing customer of ours, you should get good deals, too. All too often, companies make "Introductory Offers" to non-customers while their existing clients have to pay full price. We think this is unfair. Thus, our loyal customers get early notice of special offers or even coupon codes which are exclusive to them, while non-customers may not get the same deals. If you wish to be excluded from our regular mailings, just drop me an email to that effect: tom @ inirgee.com (no spaces). Please note that we will immediately honor your request. However, you may pop back on the list after placing another order. List management is a tedious and imperfect job--please be patient with us and kindly remind us to remove you again. All orders must be prepaid unless a Net 30 account has been approved and established by us. Our shopping cart currently accepts credit and debit cards by MasterCard and Visa, credit cards by Discover, AmEx and any PayPal payments (PayPal accepts everything). Soon, we will be taking online checks. We also accept US Postal Money Orders and checks by mail. Checks must clear the bank before shipping your order, so if you're in a hurry, use a credit or debit card, or PayPal. PayPal is a service which is free for consumer payments. The fees are paid by the sellers of merchandise. PayPal accepts most credit cards and can do debits from your savings or checking account if you prefer. Go to www.PayPal.com to read more. If you would like to tell them how you were referred, please contact us for our account number. Our email: info @ inirgee.com (no spaces). We attempt to process all orders within 1 business day. However, sometimes things take longer for a myriad of reasons so please allow 1-4 weeks for delivery. During the Christmas and Holiday season, shipping times are usually increased due to the high volume, so please order early, or pay for expedited shipping & handling. We generally ship via USPS, UPS and FedEx according to what we feel is best for each particular order. If you have another preference, please make it explicitly clear on your order. Remember, FedEx and UPS cannot deliver to PO Boxes. We will fulfill orders for shipment to foreign countries if we feel sufficiently safe in doing so. If your order is going to Nigeria, The Gambia, or Cuba, we're not likely to ship to you. Customs, Duties, Importation fees and taxes are entirely your responsibility. If you do not pay these fees but take delivery of the product, we will charge you the additional amount plus a $25.00US service charge. Be aware that foreign orders can take several weeks to arrive. Be patient, or consider paying for expedited service. OUR SHOPPING CART DOES NOT CALCULATE FOREIGN SHIPPING. You will be notified by email of the total cost of shipping, not including Customs & Duties and related fees. We will ship to the Hawaiian Islands and Alaska. The only affordable way we've found to do this is by USPS Priority Mail. Generally speaking, we are open Monday through Friday, 8:00 am to 5:00 pm Central time. We are located in Middle Tennessee Northeast of Nashville. We are usually out of the office or in one of the warehouses and not by the telephone. For this reason we suggest that you contact us via email. If you prefer to call us, be prepared to leave a detailed message so we can appropriately prepare ourselves before returning your call. We will call back, and we may call back after hours, but before 9:00 pm your time (if we know your time zone). How quickly will my lights pay for themselves in electric savings? Because of the thousands of variables to this equation, it's impossible to give you an exact answer. However, I have created a calculator which should give you the worst case scenario. This calculator does not take into account how many incandescent light strings you would have to replace during the life of your LED light strings, for example. Nor does it count labor for replacing burnt out incandescent strings while the LEDs keep working. There are many other variables, of course, but my calculator should give you a very conservative view of your breakeven point. Click here to go to the calculator. Are the hooks on your C7 & C9 light strings large enough to fit over gutter edge? Are the hooks on your C7 & C9 light strings capable of attaching to the drip edge on my roof? Note: the socket base of the C7 & C9 LED light strings is smaller than the base on a screw-in type, so the Shingle Tab Clip does not fit precisely. The only way that this bulb fits this clip is in the way it shows in the pic: the clip on the bulb facing downward into the deepest part of the light clip. I’d expect the same for the Gutter clip. Are the light bulbs interchangeable? The C7 & C9 LED light strings on our website do not have removable bulbs. 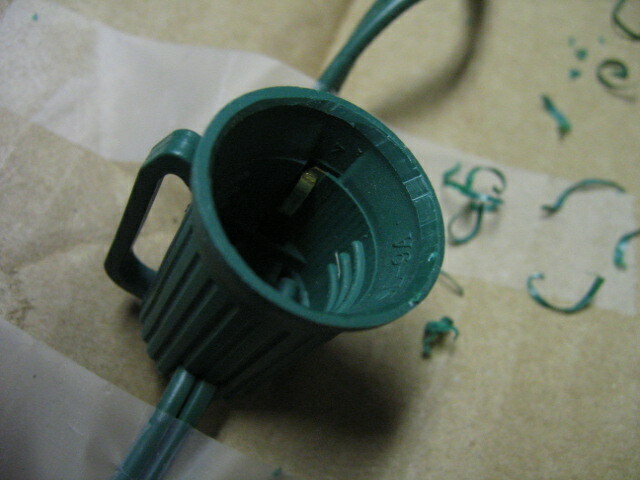 The reason is that the manufacturer wanted to reduce moisture-related problems, so they sealed the bulbs. This does tend to work pretty well, as I had a string of C9 bulbs on the fence in front of our shop for 3 or 4 years. They were still working when the tornado destroyed them in April. Now, we do have a new line of LED replacement bulbs. These are C7 & C9 LED replacement bulbs. We sold thousands of these in 2006 and we are very, very pleased with their quality. They are brighter than their pre-strung counterparts. For instance, the C7 replacements (search for "ColorSwap") each have three LEDs inside. Contrast this to the pre-strung models with only one LED. The C9’s have five LEDs inside. Contrast this to the pre-strung variety which has only one LED. Both the C7s and C9s look very similar to the ones now on our website (plastic bulb, faceted surface). Mfr. Specs: 3 or 5 LEDs inside each bulb, C7 & C9 respectively (almost as bright as a regular incandescent C7 & C9). Less than 1 watt power usage, C7 has candelabra base, C9 has intermediate screw base, use your existing light stringer—no modifications or transformer needed. Can I replace my incandescent bulbs with LEDs a few at a time, as they burn out, instead of all at one time? There is some argument as to whether one can mix LED Replacements with incandescents. One supplier tells me they can be replaced one at a time as the old incandescents burn out, but another tells me that the whole string must be switched out at once. To be safe, I'd recommend doing all of them at once. If you have experience with this topic, I'd like to hear your comments. Is my existing light stringer OK for using the new LED Replacement bulbs, or do I need to buy a special one made for LEDs? This applies to only C7 and C9 Replacement bulbs. Our Imaginary Colours LED Replacement bulbs are designed to work with your existing light stringer. You normally do not need to modify the stringer, sockets, or add a transformer. You should , of course, inspect your stringer carefully for damage before using it. Look for cuts or cracks in the cord and sockets. Check for corrosion on the plug and sockets. Clean or replace as necessary. In order to test the replacment LED lamps on over-the-counter light bulb stringers, we purchased a set of C7 incandescent lights and a set of C9s from a Big Box store. The first thing I noticed was that the C7 and C9 bulbs in the sets were smaller than traditional bulbs of the same size. This reinforces what I've been saying for years about the lowered quality of goods in the big boxes. See size comparison photos. Click to enlarge On the left is a brand-new blue incandescent C9 bulb purchased on a string of 25 from a Big Box store. On the right is a C9 LED faceted replacement bulb we installed on the string. 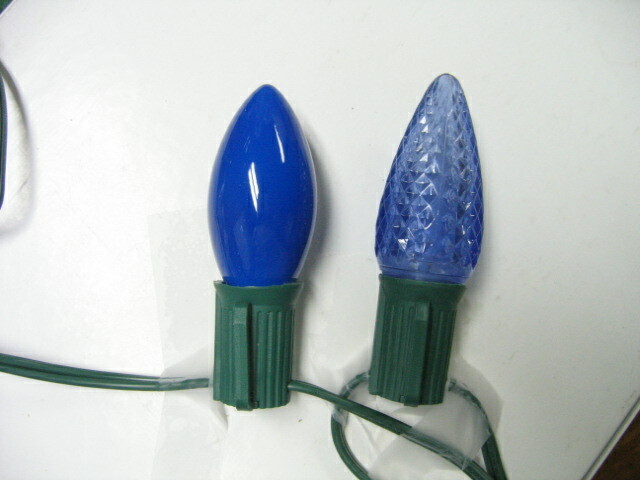 Notice the difference in size and shape, particularly the lower shoulder of each bulb, nearest the socket. 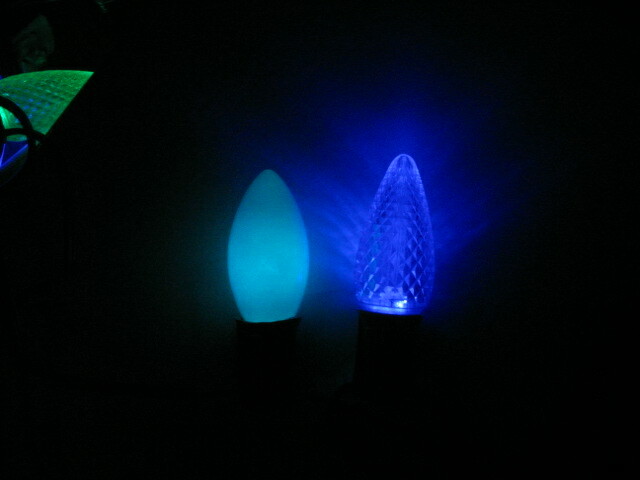 Click to enlarge Here is a photo of the incandescent and LED C9 bulbs when lighted. I had to snap the photo with the aperature turned very narrow to reduce light so the bulbs didn't wash out in the pic (if I didn't do that, you wouldn't be able to see the colors). The incandescent bulb is on the left and the LED on the right. Notice how true the LED's color is. An LED's color will never fade. The painted bulb's color will fade and peel with age. 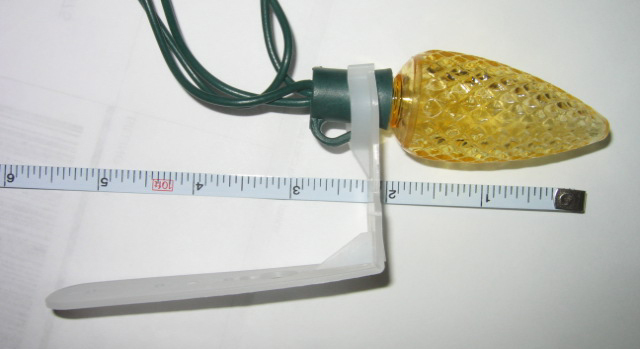 By making the bulbs slightly smaller, most customers would not notice, and even fewer would complain. However, today's big box market is a powerful force. The big box buyers dictate to the manufacturers how much they are willing to pay for a given product and it is up to the manufacturers to match that price or lose the sale. We were able to replace the lights in the C7 set with no problems. We cut the power usage on the 25 bulb string from 122 watts to 8 (eight) watts! While most people have no problems switching to C9 LED bulbs, the C9 set from the Big Box store did cause problems, however. As mentioned above, the Big Box C9 bulbs are smaller than traditional C9s. And the shape is slightly different; namely, the shoulder is more gently sloped which allowed the incandescent lights to screw in about 1/16th inch further than the LED C9s. This teeny-tiny difference kept the LED C9s from making proper contact in the sockets. Professional grade stringers don't seem to have this problem, and other brands of Consumer grade stringers may not have problems, either. To correct the C9 problem described just above, I trimmed about 1/32 to 1/16 inch off of the inside rim of each socket. The modification was easy and quick! See photos below. NOTE: I am a tinkerer and "kit basher" by nature. This means that I'm not afraid to bend and break rules now and again to achieve the results I need in a project. I cannot recommend that anyone attempt to modify an electrical component. Instead, find stringers that work with your new LED replacement lamps, or buy them new (we have them available in-stock and also by special order). Below are photos of the modification I did to a cheap set of lights I bought at a Big Box store to allow full-size C9 bulbs to fit properly. Click to enlarge The knife is pointing at the square edge on the rim of the socket. This edge is what was obstructing the C9 bulb's installation. Click to enlarge In about 20 seconds, I trimmed the square edge off the rim. This small modification allowed the replacement bulb to fit properly.